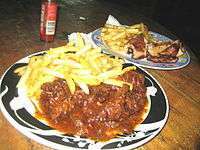 Brown stew and jerk chicken served with a side of french fries. Brown stew chicken, also referred to as stew chicken, is a dish typically eaten for dinner throughout the English speaking Caribbean islands. The dish is popular in Jamaica, Antigua, Trinidad and Tobago, Barbados, Saint Lucia, Grenada, Dominica and in Caribbean communities throughout the world. The dish is called brown because of the distinct dark colour of the dish. The colour is achieved by browning the chicken in brown sugar, which creates a rich gravy to which main vegetable components like onions, garlic and carrots are added.